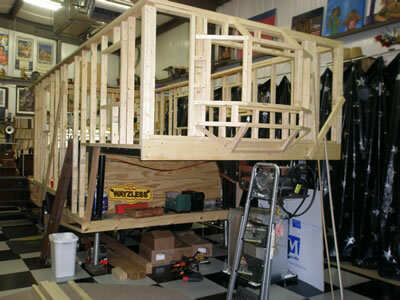 We went to Elkhart, Indiana and learned that many frame companies were now out of business, since the economy was and still is in the toilet, so we went to Trail Air and met with the owner, Dale Fenton, . 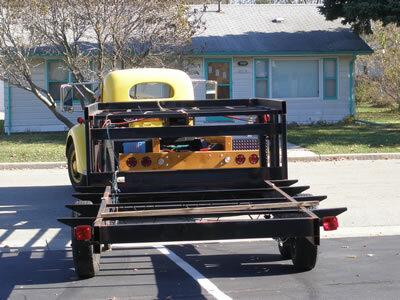 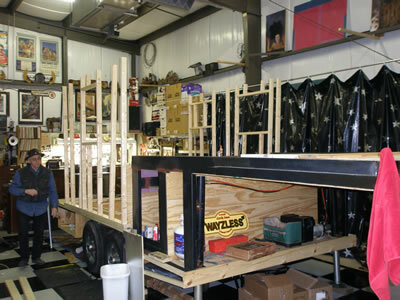 He had installed our AirRide hitch on the Wayzalot. 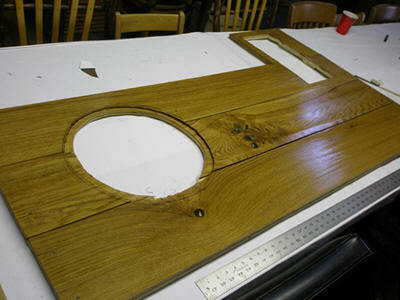 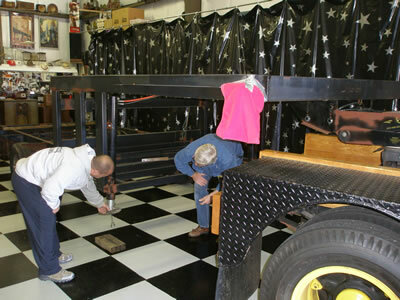 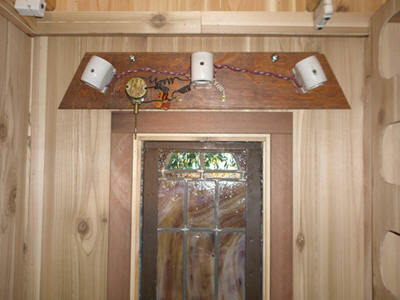 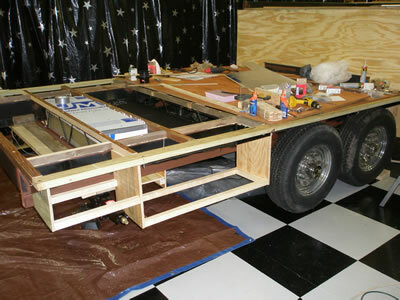 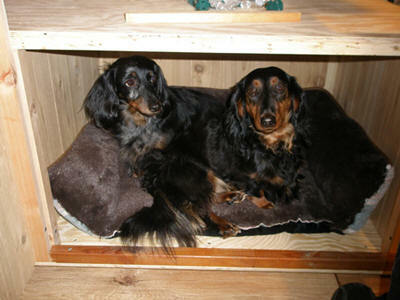 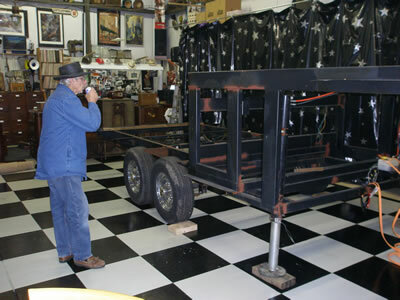 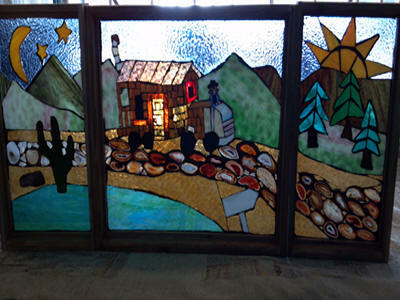 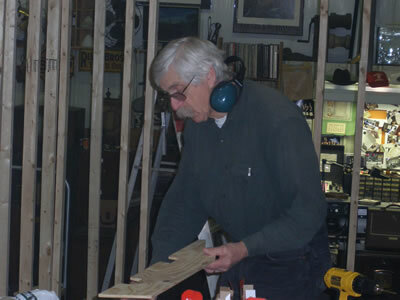 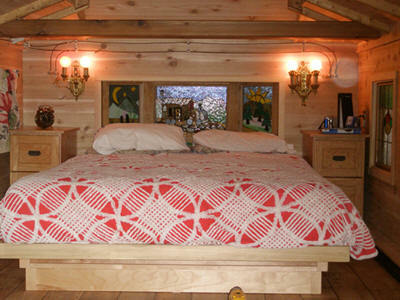 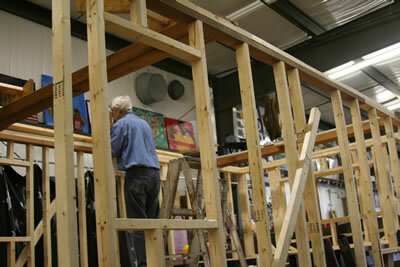 He said he could customize a frame for us and he took a forty two foot display frame and cut it down to twenty one feet. 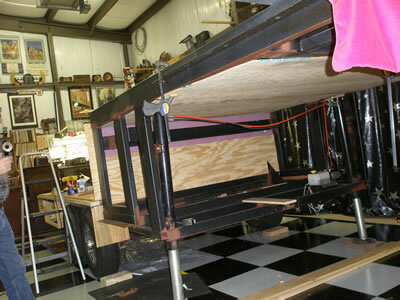 That made the new Wayzless almost eight feet shorter than the Wayzalot. 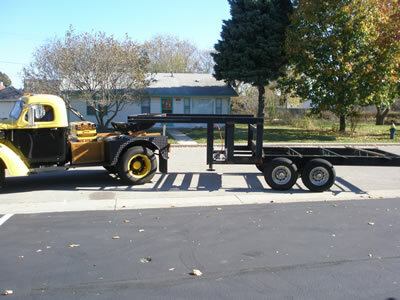 Out thinking was that since we aren’t getting any younger, maybe the next one we build should be a little smaller and easier to pull with a one ton truck instead of a tractor. 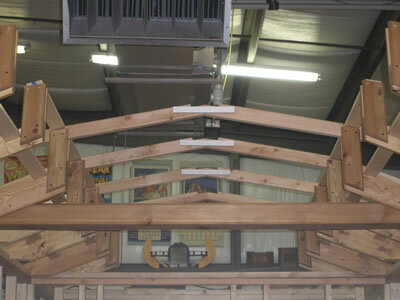 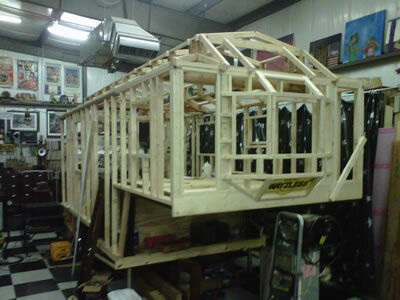 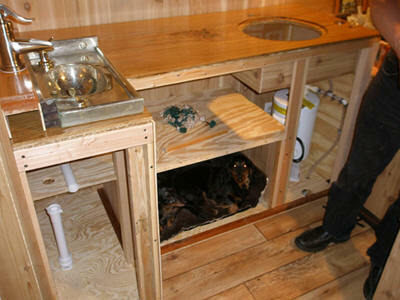 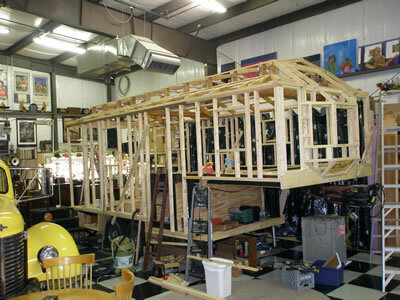 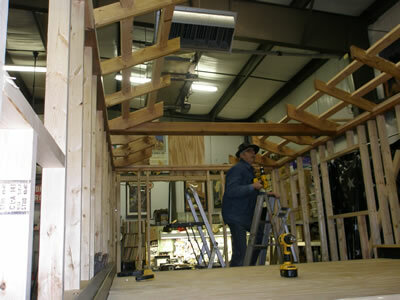 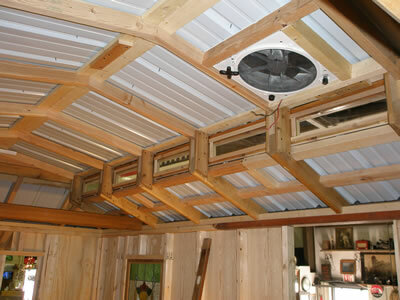 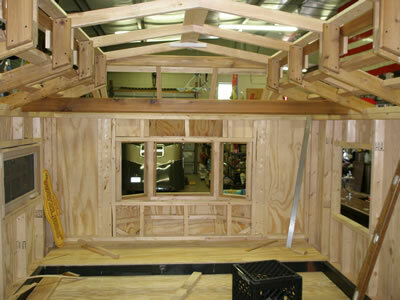 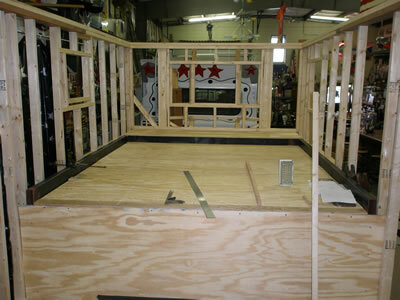 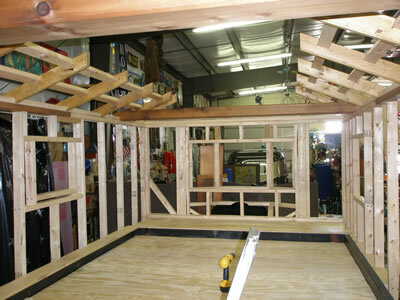 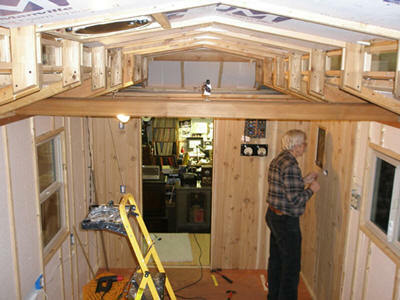 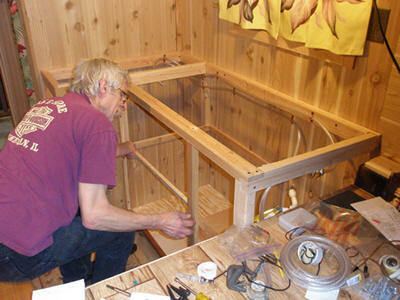 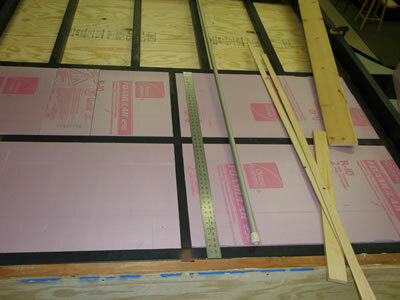 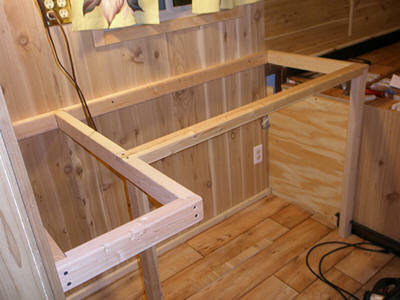 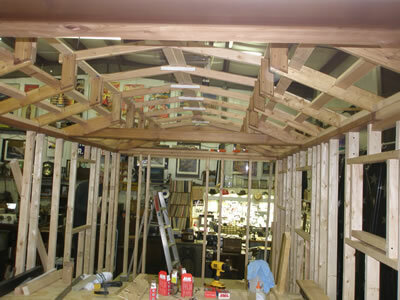 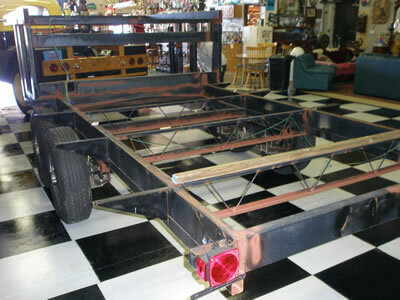 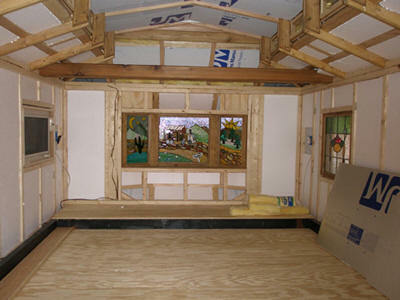 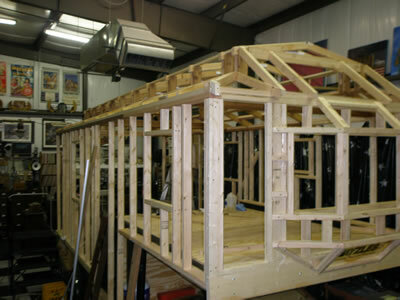 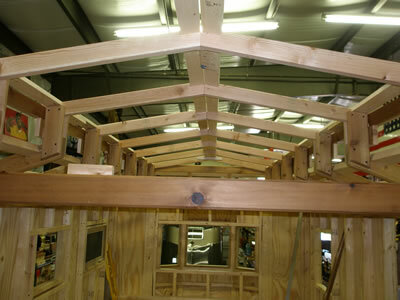 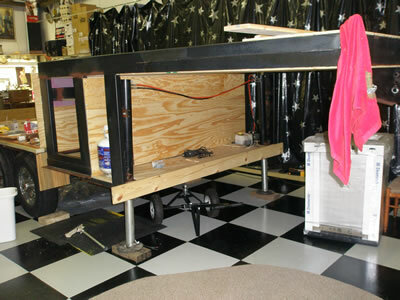 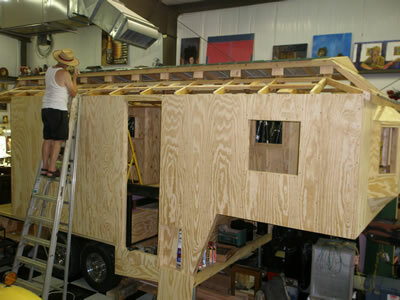 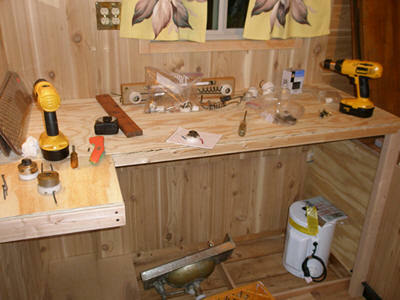 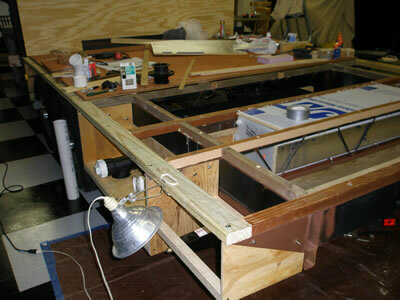 We brought the frame home in the fall 2010, and started planning how to build again. 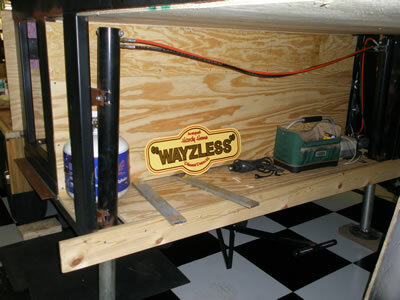 At Christmas, 2010, we received from our daughter, two new signs, titled “The Wayzless”, done by John Rich Signs, who did the original Wayzalot signs. 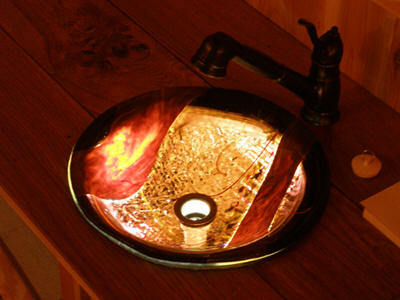 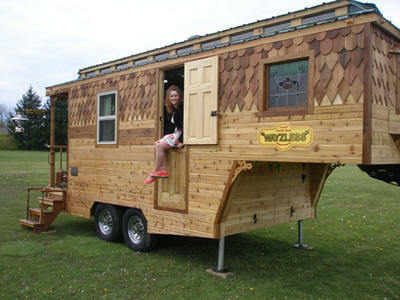 Basically, the new Wayzless is similar to the Wayzalot. 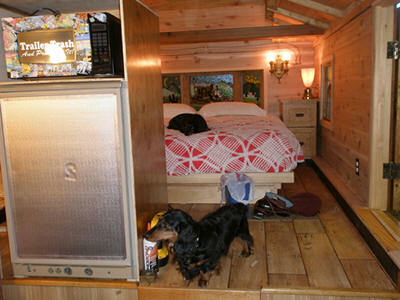 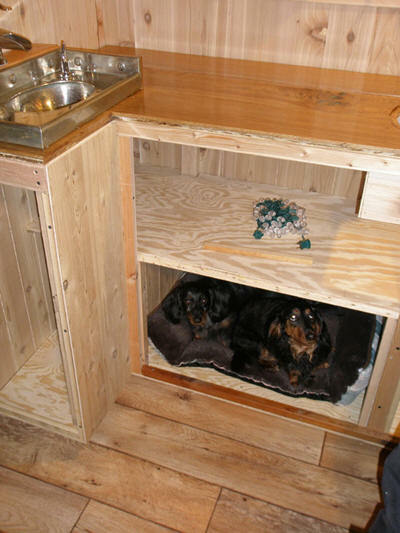 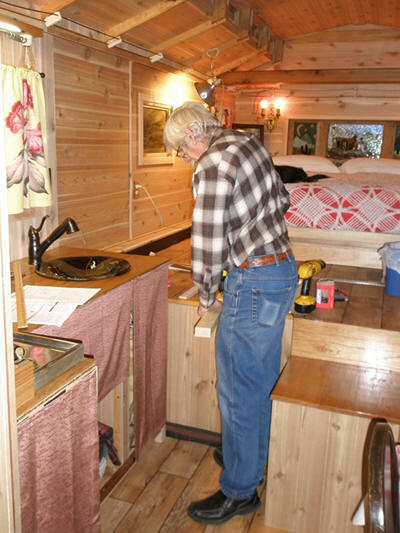 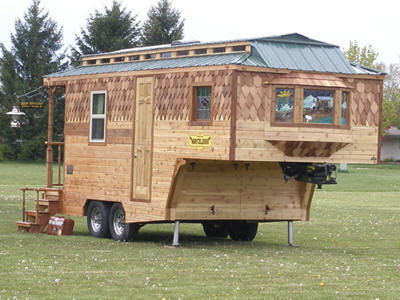 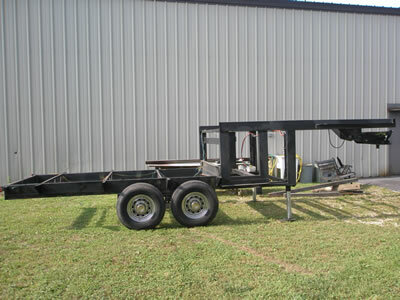 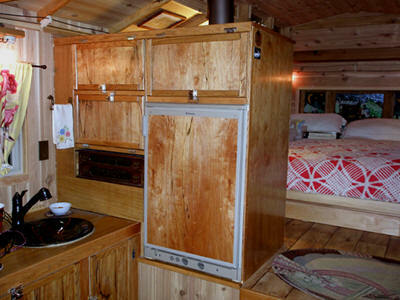 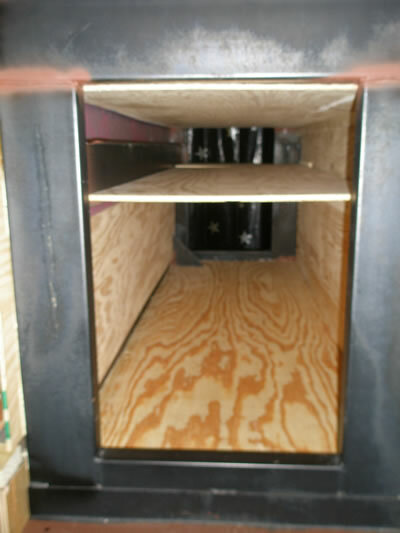 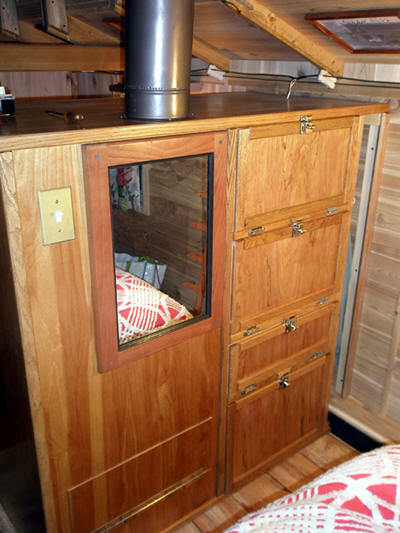 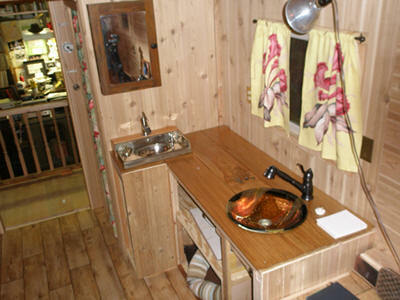 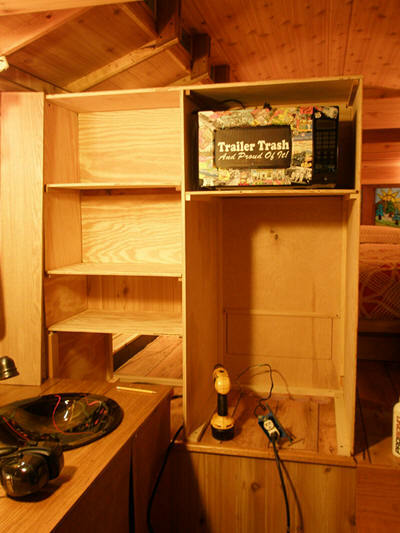 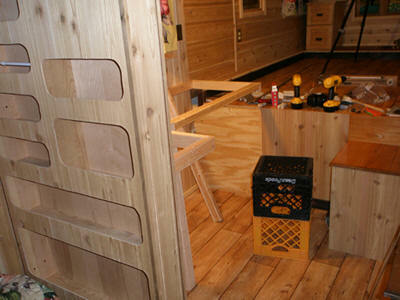 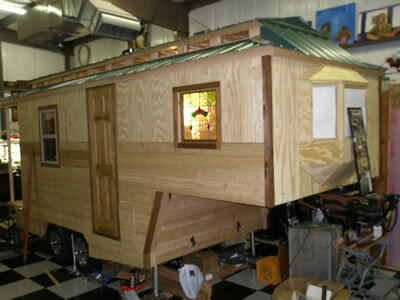 It’s a fifth wheel with a three foot back porch instead of a five foot porch, and a much smaller space inside. 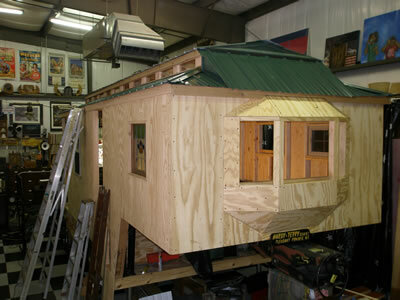 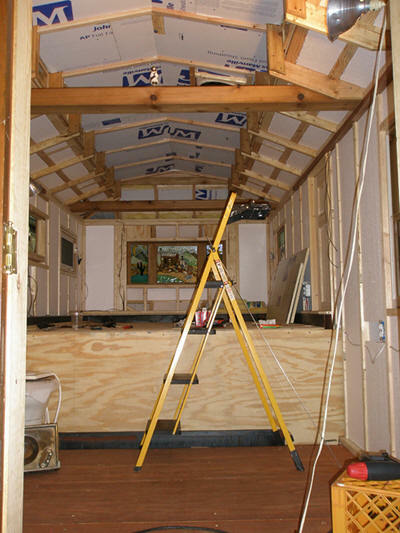 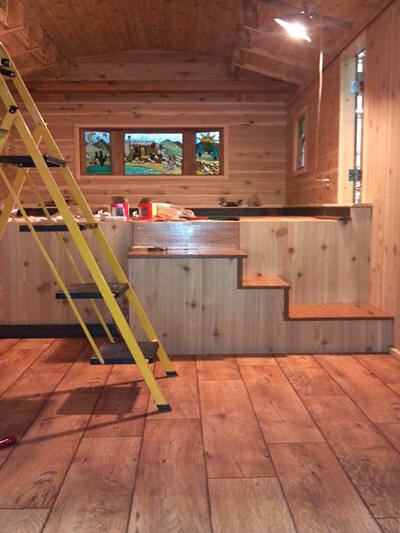 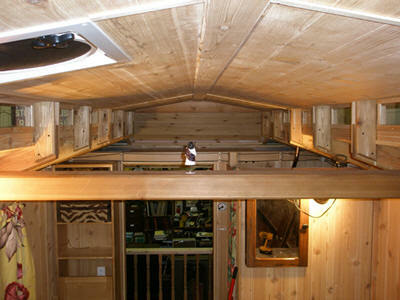 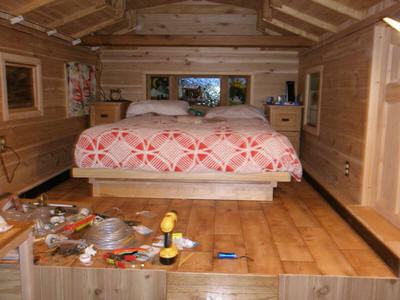 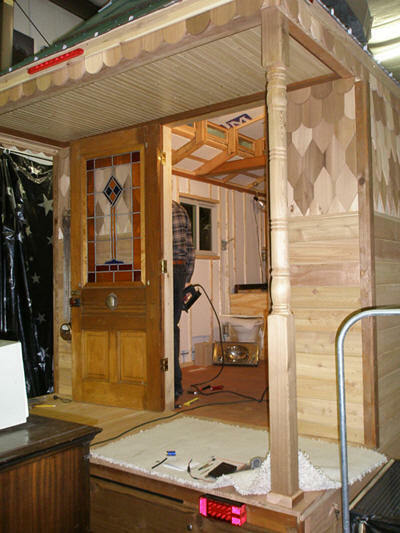 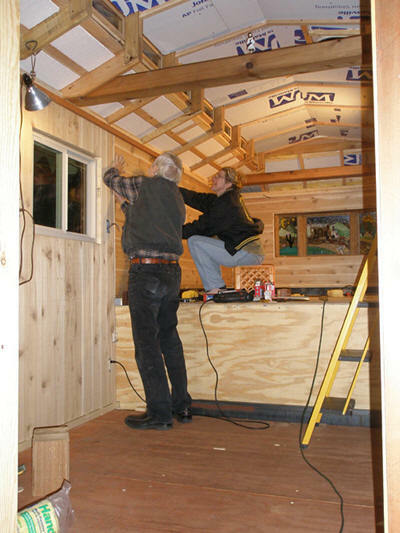 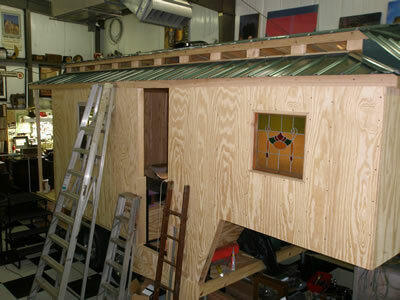 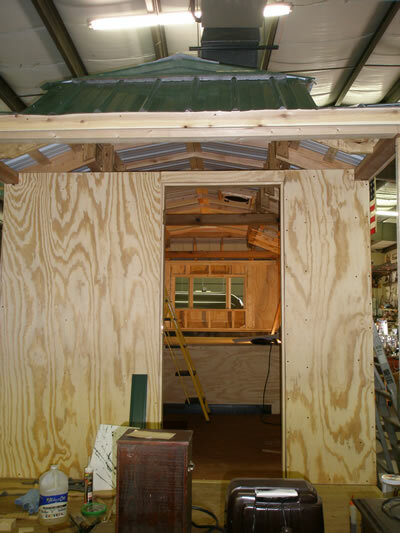 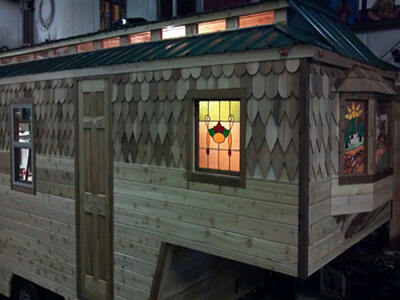 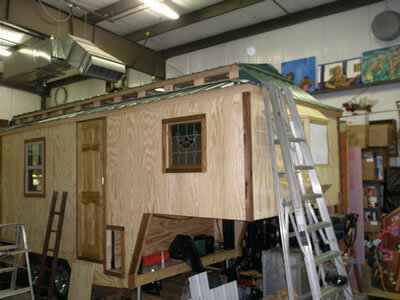 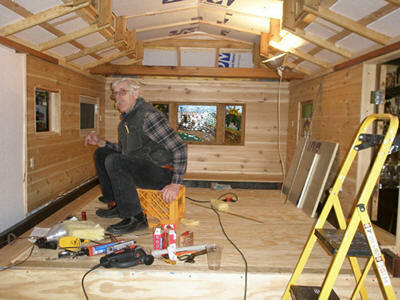 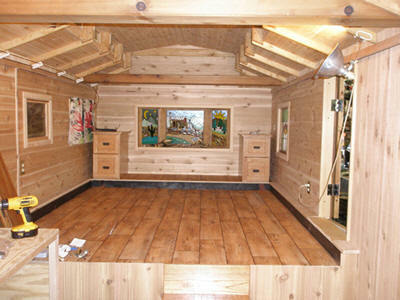 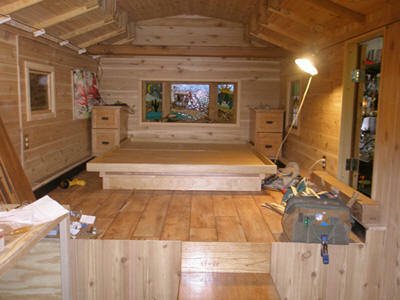 Hardy build a trolley top roof with a green metal roof and added a bay window in front. 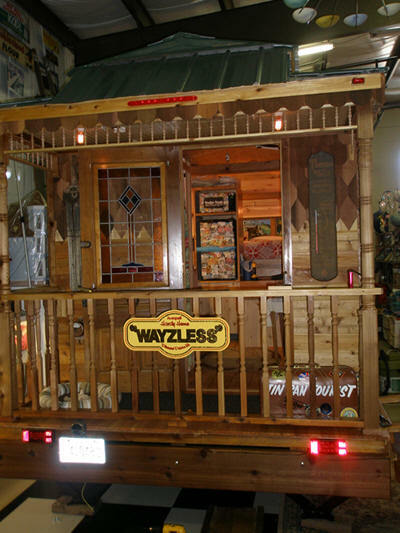 It is unique and will be the “Wayzless“………not a remake of the Wayzalot. 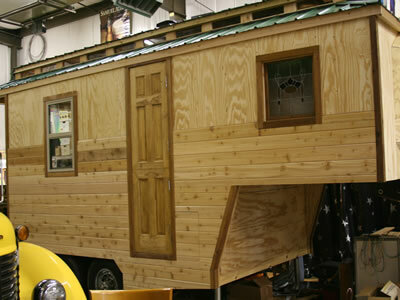 It has a garage space in front and has a basement under the floor which will hold all our camping equipment and tools that we carried in the tractor. 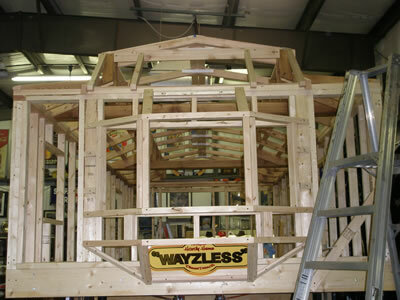 The only windows which didn’t break on the Wayzalot were the stained glass windows my sister had reinforced…so those windows are now in the new Wayzless. 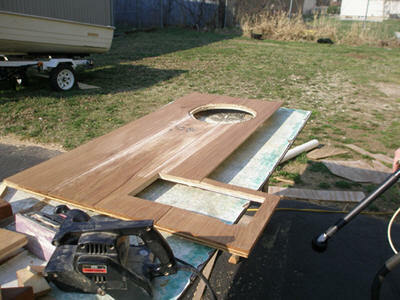 We also saved the back door which is already hanging. 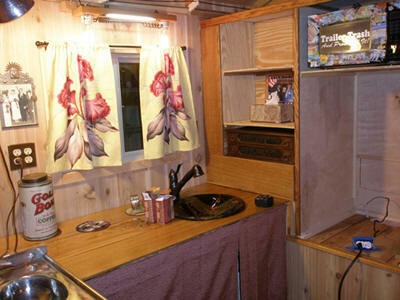 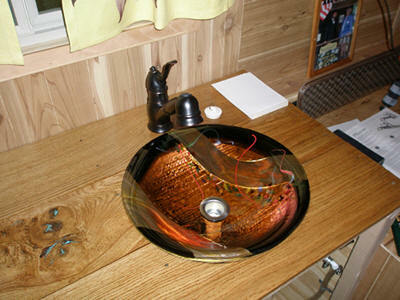 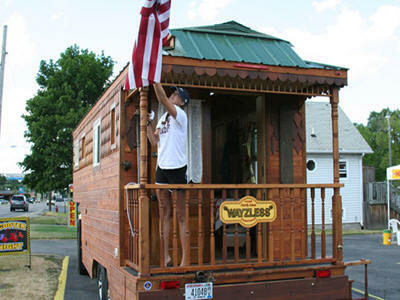 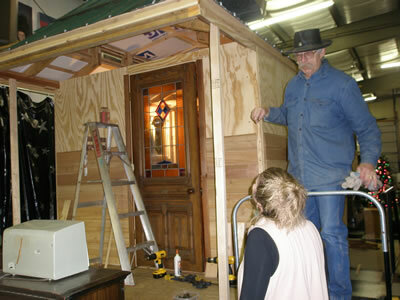 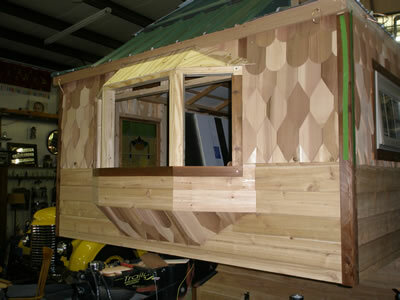 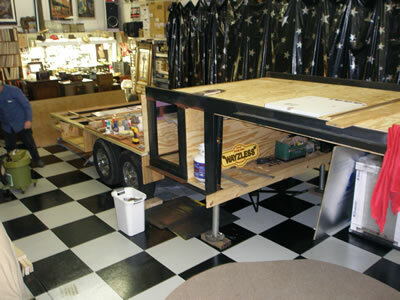 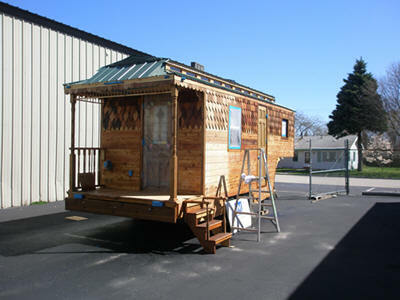 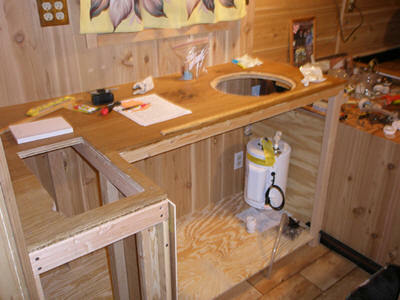 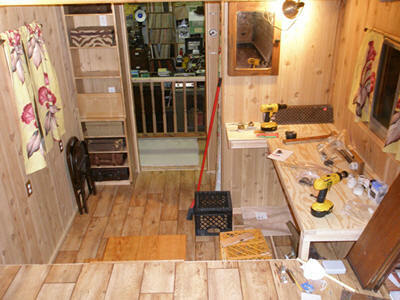 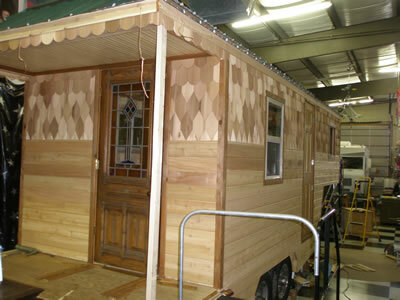 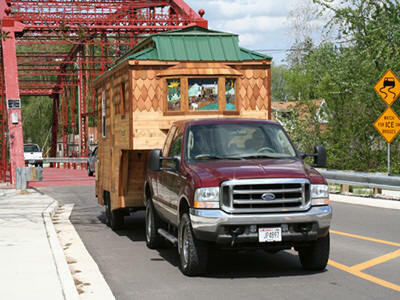 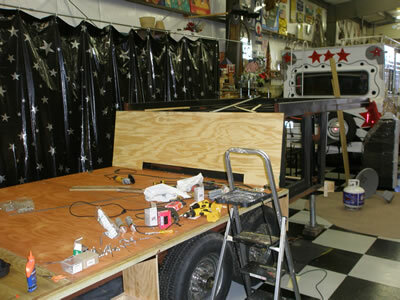 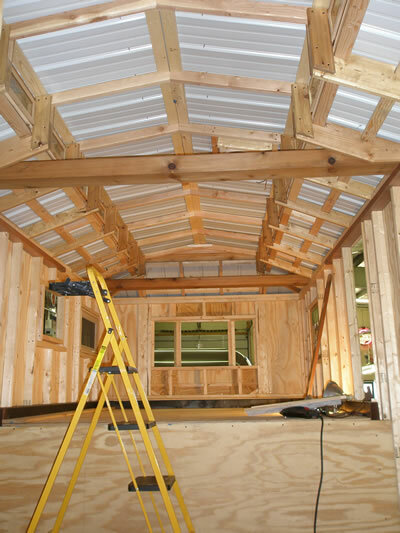 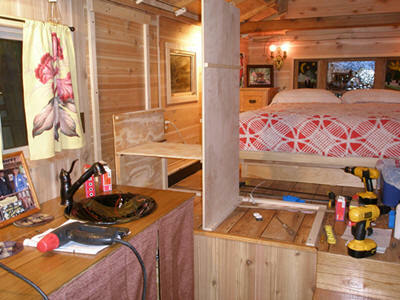 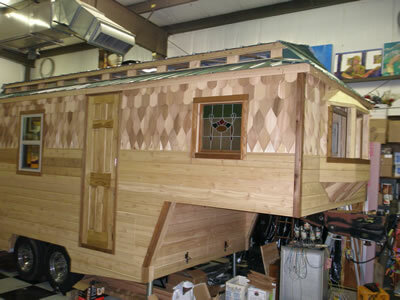 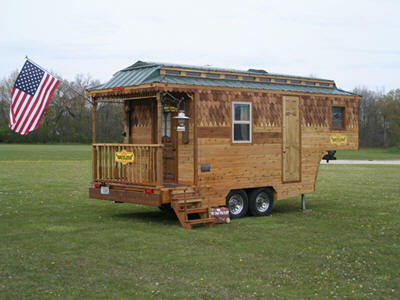 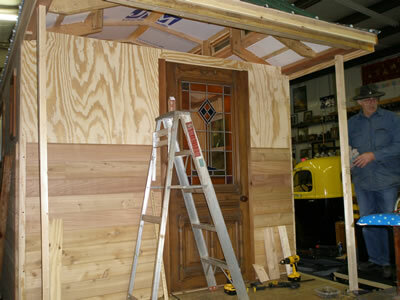 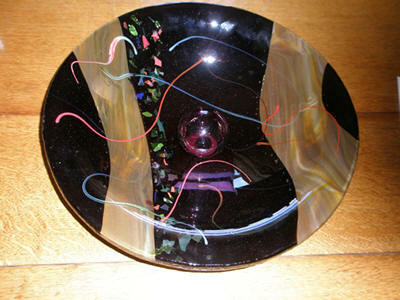 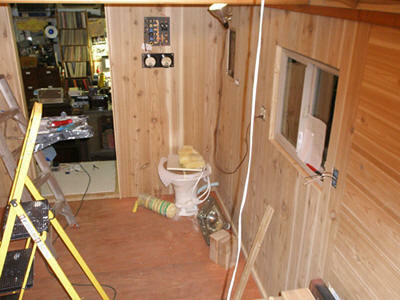 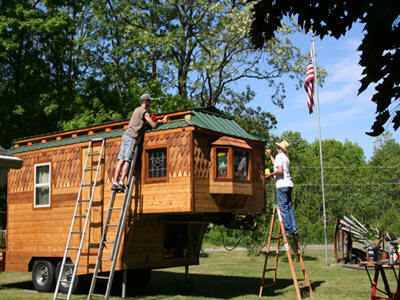 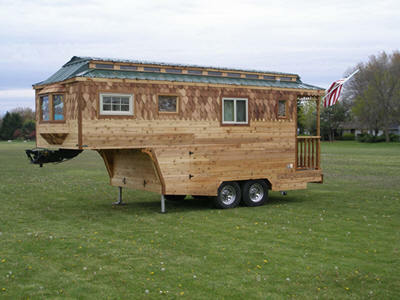 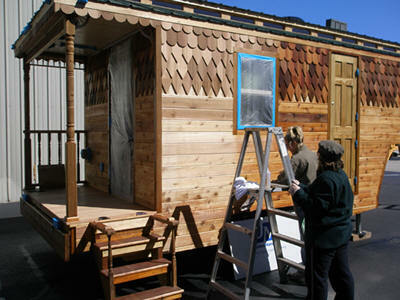 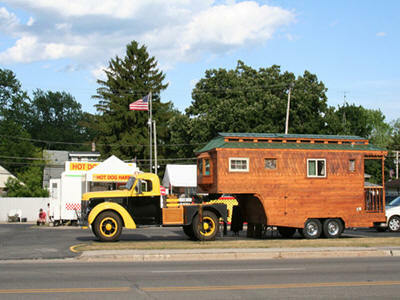 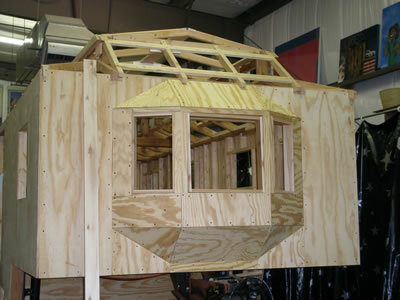 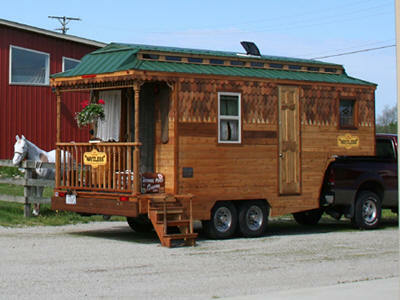 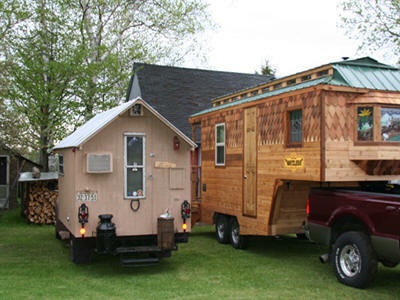 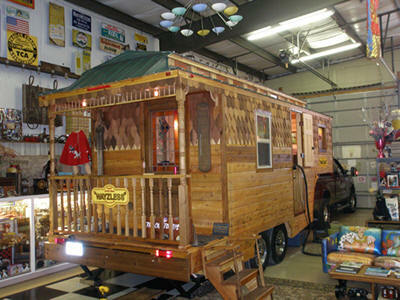 We will have the outside done this spring and the Wayzless will have its first outing at the Tin Can Tourist May Meet 2012 in Milford. 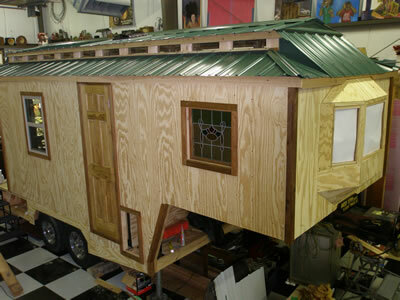 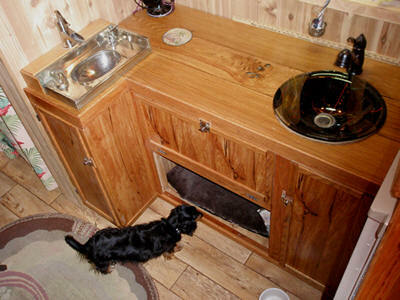 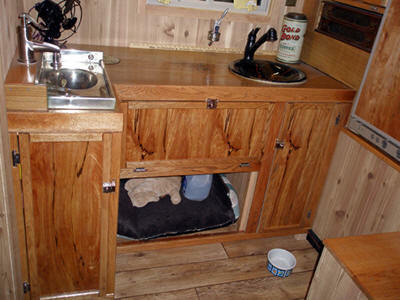 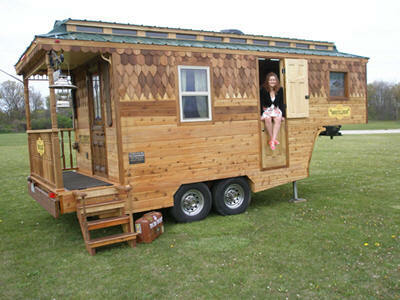 We probably wont have the inside all done but it has a bed, toilet and sink so we will be on the road again in a Hardy Home, the WAYZLESS.